The Islamic State may be determined to attack civilian targets in the west, but it’s about to get a lot harder for them to strike the United States of America. The State Department just released a new world map where America is too small for ISIS to ever find it. While previous world maps displayed the U.S. as a large and obvious target, now it’s barely visible. 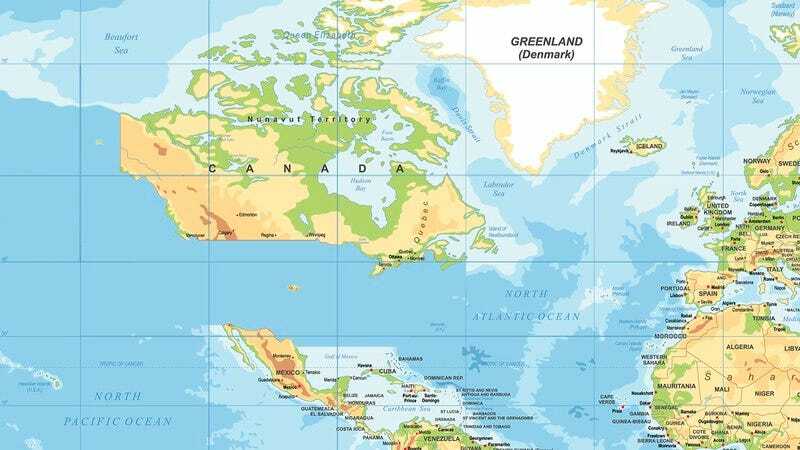 Terrorists looking to attack America will be confounded by a label saying that the region between Canada and Mexico is mostly just “uninhabited ocean” while the entire mainland country fits in less space than the old map’s representation of Colorado. Um, yeah. Good luck sending suicide bombers to America when you practically need a magnifying glass to find it. The map protects not just the mainland, but shrinks all U.S. territories around the world. Alaska is now a tiny smudge on the west coast of Canada. Hawaii may be safest of all, since it’s not only shrunk, but it’s also cunningly hidden inside a drawing of a whale. Even if ISIS notices it, they’ll likely just confuse it for an artistic flourish by the cartographers. In addition to shrinking America, the map also made North Korea five times bigger and labeled it as “New York City,” so ISIS terrorists will head over there to attack Kim Jong-un’s regime instead of us. It all adds up to a brilliant move by the State Department, and a clever defense that should help Americans sleep more soundly at night. There is still a lot of work to do before ISIS is finally defeated, but this map is a major step to secure America’s borders. We can rest easy knowing next time terrorists buy a map to decide what country to attack, there’s basically no way the minuscule, practically invisible United States will be in any danger.